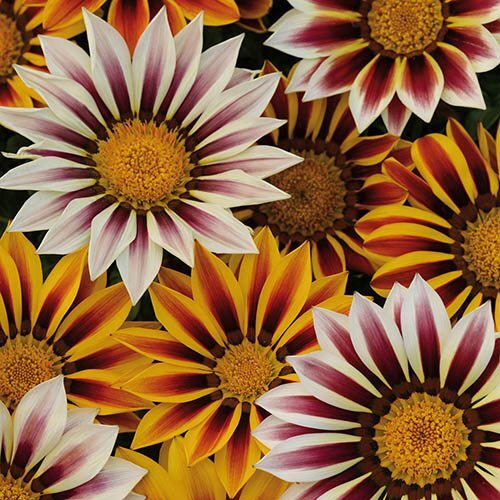 Gazania 'Kiss' Mix creates a simply breathtaking summer colour! Perfect for patio displays in any container as well as for beds and borders around your garden. At a fraction of garden centre prices! Grown from seed to provide you with perfect quality and healthy plants. Supplied as 20 garden ready plants. These super value bedding Maxi-plants are grown from seed to provide you with perfect quality, healthy plants at a fraction of garden centre prices. Gazania Kiss Mix are perfect for patio displays in any container as well as for beds and borders around your garden. Gazania Kiss Mix creates a simply breathtaking summer colour! A gorgeous mix to bring your garden to life! Plant up your Gazanias straight away and your borders and containers will be a blaze of colour in no time at. all! Deadhead regularly to maintain flowering.